I have to fess up and tell you that I love scones, breads, muffins, etc. But for the most part I’d stopped eating them because most of what you buy commercially or at restaurants tastes like crap (read: fake and chemical-laden) and has a lot of ingredients in it that: a) are refined and stripped of nutrients (the definition of refined white flour) or b) add a ton of fat and calories to an already calorie-heavy piece of food. Substitute cane or brown sugar with coconut palm sugar and add a bit less of it. Substitute sugar for applesauce or bananas. Substitute oil for non-fat Greek yogurt or mashed avocado (if you can get away with it in the recipe). Add in some golden flax meal (usually about ½ cup depending on the recipe) for some omega-3s and a little extra fiber. Substitute refined, bleached and/or enriched flours for alternative flours that have more nutrients in them. As you may know, baking is more precise than cooking, and you have to have the right flour for the job. I’ve had some real disasters happen in the kitchen when I started to experiment with alternative flours. We’re talking complete lumps that could have been used as door stops! I want to save you that pain and wasted effort, and share some basics about all of the different flours available, along with where it’s best to use them. 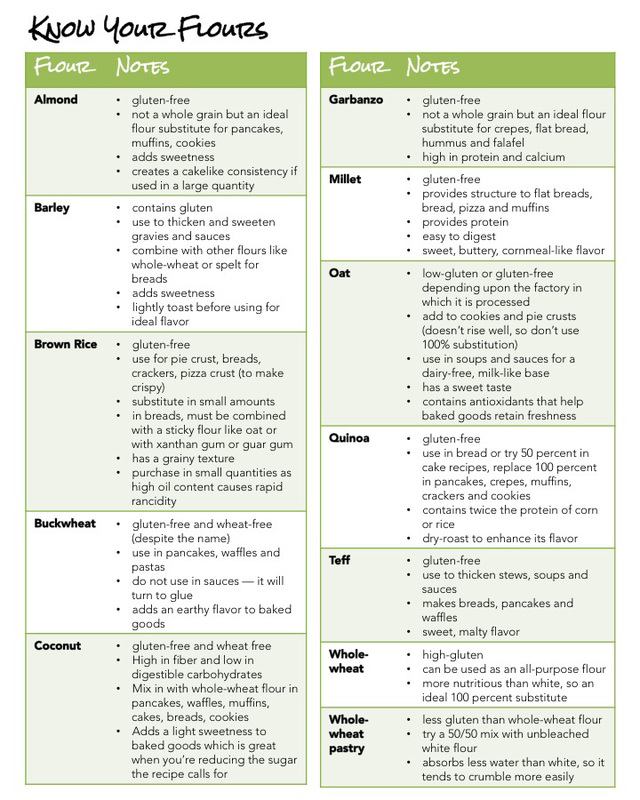 I hope it helps you choose the right flours in your next baking effort when you feel like you want to experiment with substitutions-especially if you’re searching for gluten-free or wheat-free options (all indicated below). Download a PDF version of this table to have in your kitchen when you need it. Bob’s Red Mill is one of my favorite brands for alternative flours, and their website has a lot more detail and guidance if you’re curious. And if you want a recipe I’ve already road-tested, try this Banana Zucchini Coconut Bread I posted on the blog this week. Not only is it moist and delicious, but you’d never realize that I really reduced the sugar, removed all of the oil, added more protein and mixed up the flours for nutrient quality to give you more of the good stuff. P.S. This recipe is featured in my new book, Flat & Happy–your guide to a flat belly and a happy body for life. It’s coming soon to my website and to iTunes (and hopefully to Amazon, too). I’ll be sharing some pre-release details with you over the next few weeks, as well as a free chapter so you can get a sneak peek!